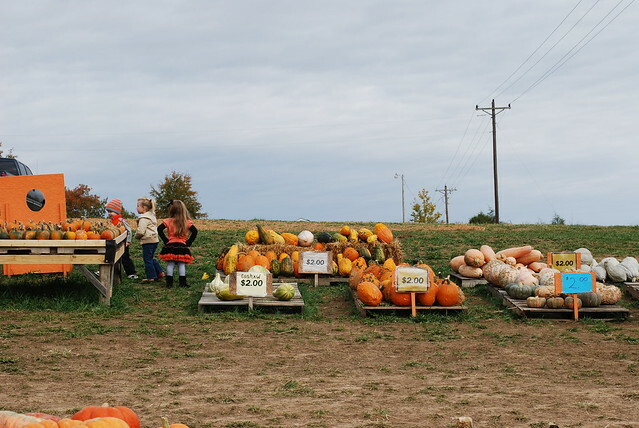 Every year since we moved back to Kentucky we've gone pumpkin picking. 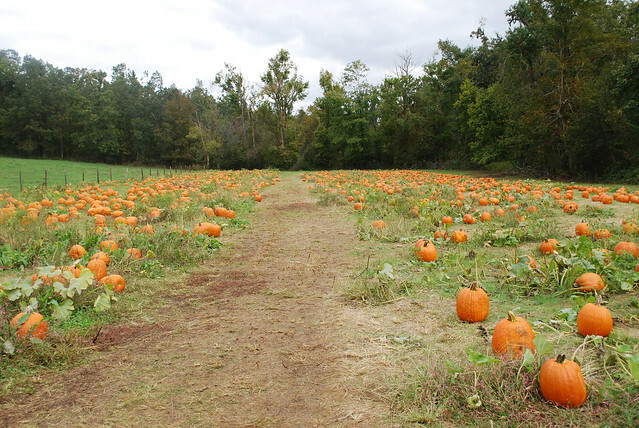 We've been to all the local favorites in Paducah - Wurth Farms, The Pumpkin Barn, and Schmidt Farms. 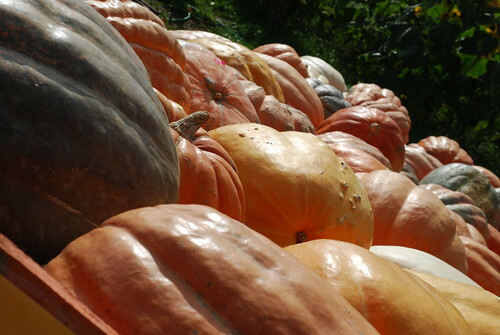 Every year through cold weather and warm we pick the perfect pumpkin (or pumpkins) for our family. 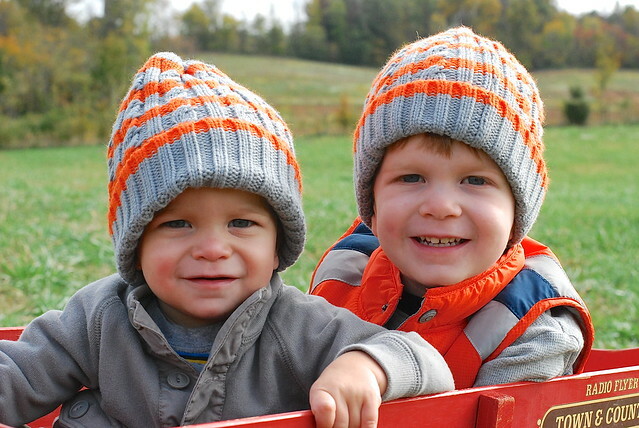 Every year we take hayrides and buy candied apples and pose for a family picture. 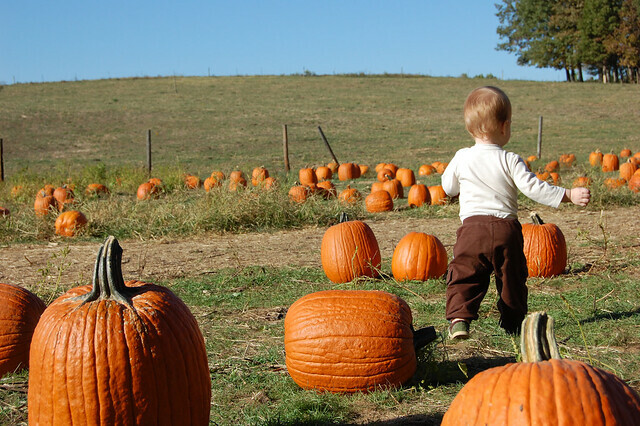 Every year as our family grows and changes, we come together to a pumpkin field and welcome another autumn with open arms. When Do You Put Up The Tree? When do y'all put up your Christmas tree? This time of year, that's a divisive question. Too early, and you're stealing Thanksgiving's thunder. Too late, and you're a bit of a Scrooge. It's a quandary of Christmas cheer. My family doesn't do Black Friday. There's no 4 a.m. trip to Wal-Mart or Kohl's for us. The day after Thanksgiving is forever reserved as The Day We Put Up The Tree. Like Nordstrom, we wait until it's appropriate, but we don't wait too long. Now, I may have been ready to succumb to the peer pressure of Facebook this weekend. Those folks who posted photos of their trees just seemed so... happy. I already have a few presents purchased, and it's just about time to pull out the Love, Actually DVD. It basically made sense, right? When is your "right time" for holiday decorations? In "ashland", "autumn", "christmas lights", "christmas", "holidays", "november", "thanksgiving", "traditions", "winter"
It's going to be a bad, snowy winter, y'all. This fact was confirmed for me yesterday when I ran across this guy. Like most country girls, I grew up with a whole lot of folk wisdom. Because so many people in my town were based in a "grow it and eat it" farming mentality, a huge focus was put on predicting the weather. Dogwood and redbudwinters. Indian summers. And the all-knowing wooly worm. Now, in case you didn't know, the wooly worm is the larval stage of the Isabella tigermoth. It can be brown or black, or a mixture of the two. Conventional wisdom has always held that the more black the wooly worms show, the worse the winter will be. The placement of the colors can also indicate weather patterns -- a brown band in the middle of a black wooly worm means that winter will start and end harshly with a warm snap in the middle. It's an old-timey tradition across the mountains -- there's even a Wooly Worm Festival in Lee County! My high school biology teacher had more than a bit of country naturalist in him; he taught us that a lot of natural phenomena that reach "folk wisdom" status are often based in scientific fact. I've read that, while there isn't a lot of scientific data to support the wooly worm's predictive patterns, their color patterns are affected by moisture and temperature. I also know that the wooly worm is usually right. Did y'all grow up reading the wooly worm? In "appalachia", "autumn", "eastern kentucky", "traditions", "weather", "winter", "wooly worms"
In "appalachia", "autumn", "eastern kentucky", "photos"
Yesterday, as I took the dogs out for a walk in the hills at my parents' house, I started thinking about how hard it is to characterize these first few weeks of November. It's kind of still football season, and it's kind of basketball season. Halloween is over, and you can't really drag Thanksgiving out into a multi-week holiday. It feels ridiculous to put up Christmas lights already, and yet I get so excited when I see the Christmas displays at department stores. Maybe that's why there are so many November memes -- we're all trying to figure out what the month is all about. Recent weather patterns here in Kentucky certainly have added to November's identity crisis. It was sweater weather as my beau and I left Rupp Arena Monday night; by the end of the week, I heard talk of tee times. Now, we all know that Kentucky weather is unpredictable -- if you don't like it, stick around a day or two and it'll change. But, this is one crazy-assed Indian summer, even by Kentucky standards. Just when I thought it couldn't get any weirder around here, November decided to throw me for a loop. I was already a little on edge today. Deer season started this morning and I awoke to shotgun blasts reverberating throughout the holler. Then, around noon, I was standing in my parents' kitchen making lunch when I felt a weird rumble. A ripple of vibration made its way across the walls of the dining room and kitchen. The china cabinet groaned and tinkled. At first, we weren't quite sure what had happened. My dad swore he hadn't felt anything. My mom thought it was just her imagination. But, soon enough, we confirmed it on our very favorite news source -- Facebook. Now, it wasn't anything like the kind of quake they experience on the West Coast. It was a 4.3 magnitude earthquake in Whitesburg, which is about 45 miles away from my parents' house. There's no significant damage to be found. Around here, my aunt suffered a few cracks in her walls. The KSP post for Southeastern Kentucky told the Herald-Leader that they'd received reports of "people's pictures being knocked off the wall, and ceramic figurines being broken." Nothing devastating, but certainly a memorable flourish on a pretty late autumn day. I guess November just wanted to be taken a little more seriously. In "autumn", "earthquake", "november", "photos", "weather"
Fall is in the air, Keeneland is underway, and it's time to break out the sweaters. And that, my friends, means it's time to pull out some dressier accessories. I always find that autumn is the best time to accessorize. The season's boots, tweeds, and sweaters call for a little more pulled-together look. What better way to achieve this look than with a pretty new pair of earrings or a sassy scarf? To help y'all get pulled together for fall, the folks at Versona Accessories have generously offered to give a $25 Gift Card to one lucky HerKentucky reader! Versona Accessories specializes in fun, affordable, and of-the-moment accessories. Whether you're looking for a statement necklace, bold bracelet, beautiful scarf or the essential jacket/ blazer of the season. Versona Accessories is celebrating their Grand Opening in Lexington's Hamburg Pavilion today. The store will be located at 2304 Sir Barton Way, next to White House/Black Market. Stop in and see them for your fall essentials, and enter below to win a gift card! In "autumn", "fashion", "giveaways", "style", "versona accessories", "what to wear"
If you're going to stay near the Paddock -- General Admission, Grandstand, or Equestrian Room -- there's no need to dress up very much. Guys are fine in khakis and polo shirts, and girls can wear slacks. In fact, you may even see folks wearing (gasp!) jeans. These are the areas nearest the track itself, and people are truly there to watch (and bet on) the horses. With that said, don't be surprised to see a lot of dresses and sport coats in the lower-levels. In recent years, a culture of dressy tailgating (think Steeplechase) has popped up among college students and twenty-somethings, and the second floor (General Admission) Sports Bar often resembles a campus bar or fraternity semi-formal. While the dress code says "casual", there's plenty of Vineyard Vines ties and Lilly Pulitzer to be seen. In "autumn", "central kentucky", "equestrian", "horse racing", "keeneland", "lexington", "style", "what to wear"